If you'd told us a year ago that Gov. Peter Shumlin would come within 2,500 votes of losing reelection and then abandon his signature policy priority, we wouldn't have believed you. But that's why we didn't go into fortune-telling. Indeed, 2014 was a fascinating year in Vermont's little political world — and a brutal one for the state's two-term Democratic governor. In November, the seemingly invincible politico nearly fell to an utterly unknown travel agent. A month later, Shumlin shocked the state by abandoning his quest to implement the nation's first single-payer-style health care system. Shumlin threw out the usual script last January by opening the 2014 legislative session with a 34-minute State of the State address focused entirely on what he called "a rising tide" of opiate abuse in Vermont. Thus began a statewide — and then nationwide — conversation about a tough problem with no easy solution. Some questioned whether Shumlin exaggerated the magnitude of the so-called "epidemic." Others wondered whether he was cynically courting national headlines or distracting Vermonters from his broken health insurance exchange. Still more wondered whether he was giving this tourist-dependent state a bad rap. But most praised him for tackling an important issue that could have been swept under the rug. By the end of the session, legislators had provided more funding to drug treatment centers, stiffened penalties for traffickers and expanded diversion programs for low-level offenders. After telling the nation last March that he was "prepared to run for president of the United States," Sen. Bernie Sanders (I-Vt.) spent the rest of the year edging ever closer to a race. He traveled to New Hampshire in April for the first of seven campaign-style events in the first-in-the-nation presidential primary state. The next month, he took to Iowa for the first of four trips to the Hawkeye State, which holds the first presidential caucuses. Sanders still hasn't said whether he'll run, but he's indicated he'd be more likely to do so in the Democratic primary than as an independent. With former secretary of state Hillary Clinton almost certain to run — and to crowd out other top-tier candidates — Sanders is well poised to serve as her leftie foil, so long as Sen. Elizabeth Warren (D-Mass.) doesn't. The Iowa caucuses are a little more than a year away. So if Bernie's serious, expect an announcement early next year. Discontent over rising property taxes boiled over on Town Meeting Day. On the first Tuesday in March, 35 towns and cities, including Burlington, voted down their school budgets — more than have done so in a decade. Vermont politicians clearly got the message — but legislative remedies proved elusive. The House spent months crafting a proposal to consolidate school districts, but its leaders couldn't quite say whether the bill would actually save money. After narrowly passing the House in the closing days of the session, the proposal died an inglorious death in the Senate. The debate grew louder last fall, as tax bills arrived in mailboxes, and became central to legislative and statewide campaigns. Weeks before Election Day, House Democrats pledged to take swift action next year to address it. In December, a study group appointed by House Speaker Shap Smith (D-Morristown) released a trio of proposals to overhaul the education finance system. Whether any of them will pass political muster — and actually reduce the tax burden — remains to be seen. Vermont's political leaders typically tackle the toughest bills in the first year of the legislative biennium and studiously avoid controversy in the lead-up to even-year elections. That maxim mostly held true in 2014, which many referred to as a "caretaker" session. But that doesn't mean nothing got done. In fact, legislators achieved a number of liberal priorities by the time they adjourned in May. Among them? A higher minimum wage, mandatory labeling of genetically modified food, universal prekindergarten, childcare unionization, shoreland protection, expanded net metering and even a ban on cellphone use while driving. In June, former Burlington legislator Dean Corren became the first candidate in a decade to qualify for public financing in his bid for lieutenant governor. Days later, Democrat John Bauer dropped out, citing his inability to qualify for the $200,000 in public campaign cash. That set up a fascinating one-on-one race between two-term Lt. Gov. Phil Scott, a Republican, and Corren, a Progressive. Throughout the summer and fall, the two candidates waged a thoughtful and (mostly) civil campaign. Though Corren managed to secure the Democratic nomination in the August primary, many top Ds endorsed Scott or sat out the race. In the end, it wasn't even close. Scott defeated Corren 62 to 36 percent, reestablishing the lieutenant governor as the beleaguered Vermont Republican Party's biggest star. It was a tough year for the Agency of Human Services — the sprawling bureaucracy that oversees everything from prisons to welfare to health care. The agency's Department for Children and Families came under intense scrutiny after the deaths of two young children under its supervision, allegedly at the hands of family members, in February and April. Several reviews found that understaffing and mismanagement at DCF contributed to the tragedies. Commissioner Dave Yacovone left the department — apparently voluntarily — in September. Meanwhile, the agency's Department of Vermont Health Access struggled to get the state's health insurance exchange, Vermont Health Connect, working properly (more on that below). Perhaps as a result, Shumlin stripped DVHA Commissioner Mark Larson of his responsibility for the exchange, though Larson still leads the department. The biggest blow came in August, when Shumlin summarily fired agency secretary Doug Racine, the former lieutenant governor and two-time gubernatorial candidate. He was replaced on an interim basis by Department of Health Commissioner Harry Chen and then, in December, by Capstone Community Action executive director Hal Cohen. With massive budget cuts on the horizon (again, see below), you can be sure that Vermont's largest and most complex state agency will make next year's list, too. Throughout the spring, Vermont's top Republicans took a pass on challenging Shumlin: Scott, former lieutenant governor Brian Dubie, Rep. Heidi Scheuermann (R-Stowe), Campaign for Vermont founder Bruce Lisman and former senator and auditor Randy Brock. On filing day in June, the last man standing was a travel agency owner from Pomfret: the virtually unknown Scott Milne. The political novice sorely lacked fundraising, messaging, policy and organizing chops. But in a year when Shumlin's declining popularity trumped all, none of that seemed to matter. Surprising nearly everyone, Milne came within 2,434 votes of becoming the first challenger since Phil Hoff in 1962 to unseat an incumbent Vermont governor. Theories of why Shumlin did so poorly were legion: Liberals thought he'd turned on them; independents were upset over property taxes and health care reform; some just plain don't trust the guy. The story wasn't over on Election Day. After declining to concede, Milne called on the legislature five weeks later to exercise its constitutional right to install him as governor when it convenes in January. Though Milne's unlikely to prevail in that Democrat-dominated venue, one thing's for certain: Shumlin's close call will severely weaken him as he enters his third — and possibly, but not certainly, last — term. For much of the spring and summer, economic development officials worried IBM might shutter its Essex research and manufacturing facility — one of the state's largest employers. In October, Emirate of Abu Dhabi-owned GlobalFoundries acquired Big Blue's semiconductor division and pledged to keep it open for the "foreseeable future." Vermont's economy may have dodged that bullet, but it continued to struggle in other ways. Personal income tax collections have come in under expectations every month since April, indicating that many Vermonters still aren't feeling the effects of the nation's slow-moving economic recovery. That's left a significant hole in the state's coffers. Shumlin and legislative leaders were forced to cut $31 million from this year's budget in August, and they're currently contemplating another $17 million in midyear cuts. A projected $100 million gap in next year's budget will surely dominate the dialogue in the coming legislative session. Democrats lost a dozen seats in the state legislature — and Vermont's U.S. Senate delegation was stripped of several key positions. After Republicans took the Senate, Sen. Patrick Leahy (D-Vt.) was booted from the president pro tem's office and lost the chairmanship of the Senate Judiciary Committee. Sanders lost the top spot on the Senate Veterans Affairs Committee, though he was elevated to ranking member of the Senate Budget Committee. National races hit Shummy hard, too. The chairman of the Democratic Governors Association had hoped his candidates would win big races in Florida, Wisconsin, Georgia and Kansas, among others. They didn't. Instead, they lost deep-blue states like Massachusetts, Maryland and Maine. Shumlin handed over the DGA reins to Montana Gov. Steve Bullock in December, leaving him free to, well, focus on his own political career. If there was one political issue that dominated 2014, it was health care reform. As it did last year, the federally mandated insurance exchange known as Vermont Health Connect continued to disappoint. It suffered from contractor woes, change-of-circumstances backlogs and security issues, before going offline entirely in September for two months. There's no question that Vermont Health Connect's woes complicated Shumlin's task of financing his ambitious single-payer health care proposal. But most Vermonters were nevertheless shocked when the governor abandoned the plan entirely, saying the numbers just didn't add up. 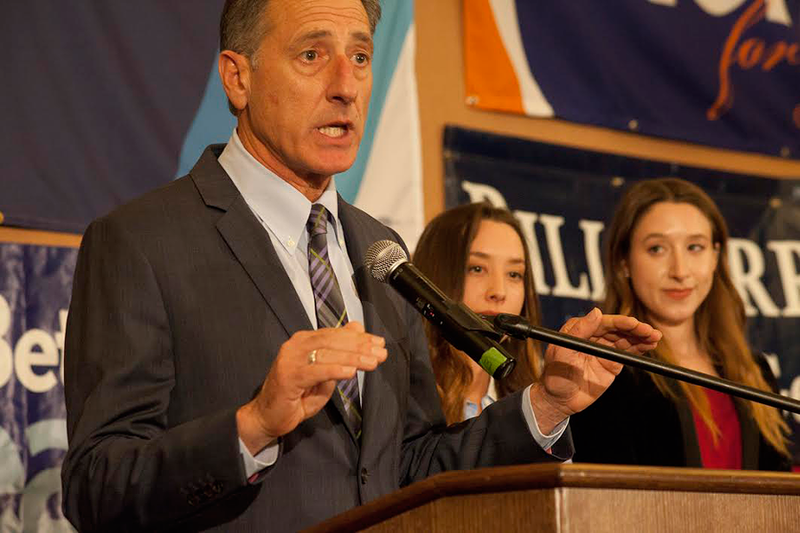 As he announced the news at a crowded Statehouse press conference on December 17, Shumlin conceded that this was "the greatest disappointment of my political life, so far." The original print version of this article was headlined "A Shum-Dinger of a Year"